Spain is a country that loves to use any occasion to party. You have all different kinds of parties but some of the most fun ones are the neighbourhood parties. Every ‘barrio’ starts decorating the streets weeks before. So if you see people standing on steps, hanging up all kinds of different decorations don’t be shy to ask when the ‘fiesta’ will start! Every barrio has a different way of celebrating their fiestas del barrio. 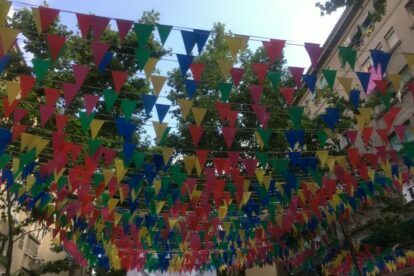 The fiestas of Gracia are some of the biggest and most popular. In Barceloneta it’s several weeks of sometimes being woken up early in the morning by drum bands walking through the streets, until fireworks late at night. A lot of traditions are being celebrated. So if you want to know exactly what the party is about just ask the Catalans, they will be willing to tell you everything about it. Bars sell drinks and food in the streets and there is music everywhere. It is a real nice mix of young and old people all partying together. Since the dates of the fiestas are not the same every year you should check out the website.